lower right in graphite: GRUBSTEIN; verso: upper center in graphite: Milton Grubstein / June 18, '36 / Met. Mus. 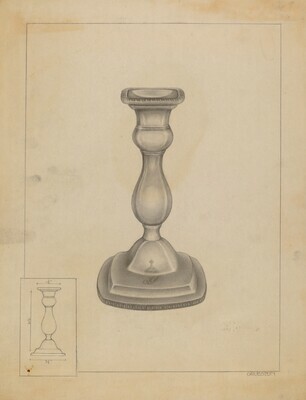 / Candlestick / G. Forbes, Maker / L.2559.2.3 / Top shelf, right. / Case 2, Alcove F-26-B / Off L7. Amer. Wing.